Based on the novel POINT OF IMPACT by Stephen Hunter. A former military sniper living in the mountains, in self-imposed exile, is lured back into the game by a request to out think a would-be assassin and help squelch an assassination attempt on the President of the United States. Before you can say, "Not so fast..." the guy takes on the challenge, is double- crossed and framed for, you guessed it, an assassination attempt on the President of the United States of America! Well you knew that was going to happen, didn't you? Of course you did. For me, one of the most fun aspects of this movie is that it's an old-fashioned, noisy, shoot 'em up. You just know the bad guys are gonna get their just desserts, as the saying goes, and that lots of stuff is going to get blown up in the process. True to form, the bad guys aren't all that bright. I mean, any fool knows you don't mess with a guy's dog and you don't mess with his woman! And if you do? Well, sir, there are consequences. 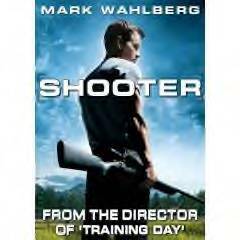 I'm not a Mark Wahlberg fan, but like Matt Damon, in the Bourne movies, Mark fits the character, Bob Lee Swagger, the former sniper. I didn't find Danny Glover's character (a shadowy government agency type) or Ned Beatty's Senator character particularly interesting but then, they're pretty much stock villians. Their task is to impede the good guys and they do manage to do that. Michael Pena is fun to watch as the newbie FBI agent who is in over his head much of the time. All in all, a fun movie, not to be taken too seriously. Just sit back and enjoy the roller-coaster ride. Copyright © 2007 Over My Dead Body! All rights reserved. Reproduction in whole or in part in any form or medium without express written permission of Over My Dead Body! is prohibited. OMDB! and OMDB! logos are trademarks of Over My Dead Body!